Not sure what other formats to start playing or building decks for? I've got your back. Only constructed formats will be posted (no draft/limited/cube/etc.). Sorry if this rains on your parade. Pick any core set in the history of Magic and sandwich it between two blocks of your choice. You've just built your own standard. Everyone builds their own and faces off. Banned: Anything before 5th edition. Anything banned in Legacy or Block. All commons all the time! It's really all there is to it. Build a 60 card deck with nothing but commons. All commons except for 5 uncommons. One-third of every deck must be of a single creature type. Goblins, Faeries, and Elves OH MY! Just kidding, those are all banned. Also: No sideboards. Banned: Any lists with Goblins, Faeries, or Elves (they are the best tribes after all so stop complaining). Teams of two face off in this format. Each team has 30 life (or it takes 15 poison counters), shares their turn, and can't have more than four of any individual card between the two decks of that team (example: You and your teammate can't both have 4 copies of Lightning Bolt) with the obvious exception of basic lands. Free-for-all! Everyone gets a free mulligan and everyone gets to draw during their first turn. There is no official ban-list or anything of that sort. Just make sure to agree on the attack method before starting. Examples: only being allowed to attack left OR right, only being allowed to attack left AND right, being allowed to split attacks between multiple opponents, or my personal favorite: allowed to attack anyone at the table but you can only attack one person at a time. Multiplayer rules apply here but there's one more minor detail. There's an extra deck involved: the chaos deck. This deck consists of 20-30 cards. After that though, there are differing opinions on what happens next. The official site says that the player to go first is the designated "chaos player" until they die and whenever it's their turn, they draw from the chaos deck during their upkeep and everyone can use any abilities or effects on that particular card (the card can't be countered or prevented by the way - that rule always stays the same). In another version I've seen, each player draws a card from the chaos deck during their upkeep, it resolves, it only effects them unless it's a global effect, and then you finish your turn and repeat. In the latter version, it's important to mix up spells that have positive and negative effects. Also remember that creatures have abilities as well but you can't actually play and use the creature itself. This is a multiplayer variant. You can join in a game at anytime with any deck. Once you die, you can rejoin with any deck you want. Whenever you join you're in a safety bubble that isn't affected by anyone and you can't affect anyone else. As soon as it's your turn (in turn order at the table) and you start your fourth turn then you're officially in the game again. The game basically never ends until everyone either chooses not to respawn or forfeits. 5 players are needed for this multiplayer variant. Each player pilots a deck consisting of one of the 5 colors of Magic. 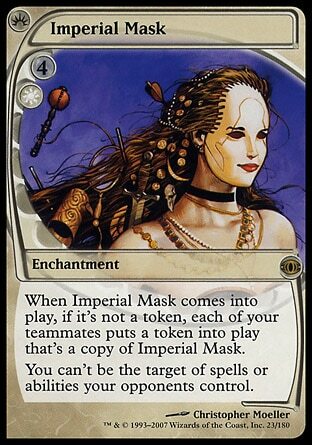 The players sit in the same seating arrangement as the back of a Magic card (the star shape with the 5 mana symbols). Decks can't contain cards that reference other colors and/or produce mana of other colors. A player wins when they've defeated their representative color's enemy pair (Example: White wins if Black and Red are defeated EVEN IF they aren't defeated until after White's death). White goes first and any player can attack or target any other permanent or player (even allies). Team match with 3 VS 3. Each side has an Emperor and 2 Generals and the Emperor sits in the middle (the cheeky devil). Emperors have a range influence of 2 and Generals have a range influence of 1. This means a global effect from a General would only spread to the next person on either side of them. Emperor range influence means it affects everyone except the other Emperor (at the beginning at least). Players can only attack the person seated next to them. This means the Emperor has no one to attack at the beginning of the game. Everyone has separate life totals and a team loses when their Emperor dies. Emperors also have the "deploy creatures" option: Each creature an Emperor controls has -tap- Target teammate gains control of this creature. They can only do this as a sorcery. This is a multiplayer variant involving Plane cards that affect the status of a game. You can find out more about the official product over here: click. One player VS three or more. This multiplayer variant gives the Archenemy access to a Scheme deck that grants them additional power. More info on the official product behind this door: click. Arguably the most popular format of all time. This multiplayer variant involves a 100 card singelton deck (that means only 1 of any card except for basic lands) where 1 of those cards is your Commander (formerly known as EDH General). Your Commander must be a Legendary creature and they aren't actually shuffled into the deck at the start of the game. You can play your Commander at any time you can pay the cost. If your Commander dies, you can play it again but it will cost an additional 2 colorless for each time it's kicked the bucket. Your deck must be constructed of the same colors as your Commander. 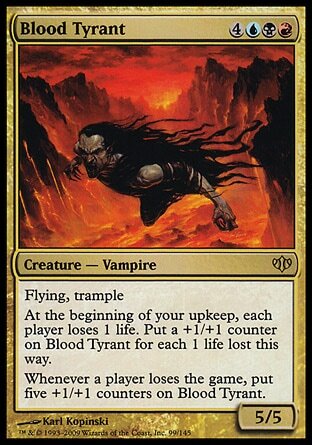 Each player starts with 40 life but a Commander only needs to deal 21 points of damage to defeat an opponent. Full details and rules over here: click. A multiplayer variant for 10 or more players that allows multiple sections of the table to play simultaneously. It's a bit complicated and my explanation would be longer than most of the other variants combined so I'm just going to give a link here: click. There are obviously other formats but I think this is enough to start off with. Feel free to discuss your favorite formats below in the comments. This is Kylak signing out and attempting to play a Planechase Archenemy Emporer Commander Multiplayer format.